How to safely get a tattoo removed using lasers? Tattoos are permanent designs made on the body when pigment is inserted into the skin through tiny ruptures in the top layer of skin. Modern day tattoos are applied using an electric tattoo machine that has needles which rapidly puncture the skin in an up and down motion. Tattoos are meant to be permanent; hence removing them is quite difficult. Some surgeons guarantee complete removal, while the majority of them say that complete removal is not possible. Today, there are several options for tattoo removal that have proved effective. However, successful tattoo ink removal depends upon factors like size, location of the tattoo, how long it’s been there and an individual’s ability to heal. Doctors say that they cannot predict the exact degree of ink removal because they usually don’t know which of the 100 inks available today was used. Dermabrasion, wherein the skin is “sanded” to remove its surface and middle layers. Excision, in which the surgeon removes the tattoo using a scalpel and closes the wound with stitches. In cases involving larger tattoos, a skin graft from another part of the body might be required. Although these procedures are still used today, laser tattoo removal has become the standard treatment for tattoo removal as it offers a bloodless, low risk, and effective alternative with minimal side effects. Lasers produce short pulses of light that harmlessly pass through the top layer of the skin to be absorbed by the tattoo pigment. The laser energy causes the tattoo pigment to break down into smaller particles which are then removed by the body’s immune system. Researchers have confirmed which wavelengths of light need to be used for tattoo ink removal. In case you’re wondering whether the laser effects normal skin, do not worry. The laser beam only targets the pigments in the tattoo, without damaging the surrounding skin. Pre-treatment steps include application of an anesthetic cream 2 hours before the procedure. This is wiped off just before the procedure begins. Laser tattoo removal results will start to appear after approximately 2 weeks. Some fading, either general or in spots, can be seen after this period. Unfortunately, both getting and removing tattoos is uncomfortable. The impact of the energy from the laser has been described as similar to being snapped by a thin rubber band. Since black pigment absorbs laser wavelengths, it is the easiest to remove. However, other colors, like red and green, selectively absorb the laser light and are treated only with selected lasers, depending upon the pigment color. 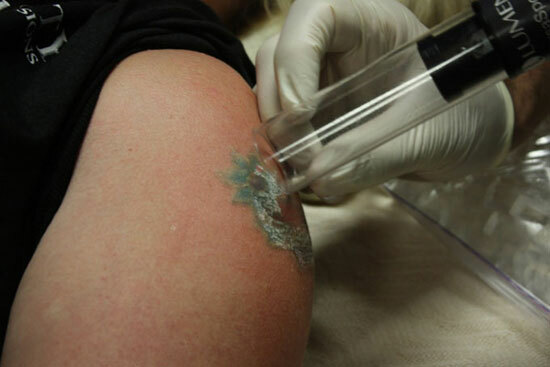 Laser tattoo removal aftercare involves applying antibacterial cream and dressing on the treatment area. The area needs to be kept clean at all times. A shower the day after treatment is okay, but the treatment area must not be scrubbed. Does laser tattoo removal work, and how much does, it cost are common questions people ask. Well, getting a tattoo removed is a lot more expensive than getting one done. The cost of removal can range from several hundred dollars to thousands of dollars, depending on the size, type and location of the tattoo, and the number of treatment sessions required. Treatments > How to safely get a tattoo removed using lasers?